Frequently Asked Questions on our products and services..
Where can I buy Matrix products? Matrix frames and wheels are available on sale from this website now and selected retailers from the end of March. You can also use the "Bike Builder" section here to specify your own components and we will build the bike for you before sending it out to you with no delivery charge. 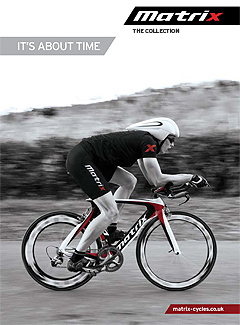 Matrix have been building bike frames and wheels since the late 1990's and are well established across Asia and Europe. We launched in the UK in January 2012 with a view to supplying the discerning cyclist with a full range of road and mountain bikes through our website and a few carefully selected stores.